On June 27th, 2010, I wrote a review of Shelley Stout’s book, Radium Halos: A Novel about the Radium Dial Painters, for my blog – please look in the June Archives. The review was entitled: “Have You Had a Little Taste of the Paint Yet?” I mentioned in my review I was interested with this book on a personal level because I had a great aunt, Mary Vicini Tonielli, who worked for the Radium Dial Company. She died in 1930 at the very young age of twenty-one due to radium poisoning. Shelley Stout will be visiting Ottawa on Friday, October 29th, to talk about her book at an event to raise money for a memorial in honor of all of the women who worked for the Radium Dial Company. The event is being sponsored by Laborers Local 393 which will be held at the Ottawa Knights of Columbus Hall, 401 W. Main Street, Ottawa, IL. The event also includes a fish fry dinner for $8.00 per person. The occasion will be held from 4:00 to 7:30 p.m. All of the money raised will go to the monument being built to be placed in Ottawa. Shelley Stout is also donating $1.00 for each copy of Radium Halos sold at the event for the monument. The monument is being crafted by local Mendota artist, William “Bill” Piller. If you are interested in donating money towards the Radium Girls Monument please make out your check to City of Ottawa and send your donations to Mayor Robert Eschbach, City of Ottawa, 301 W. Madison St., Ottawa, IL 61350, stating it is for the Radium Girls Monument. I was fortunate to have lunch with Shelley on Friday prior to her evening event. 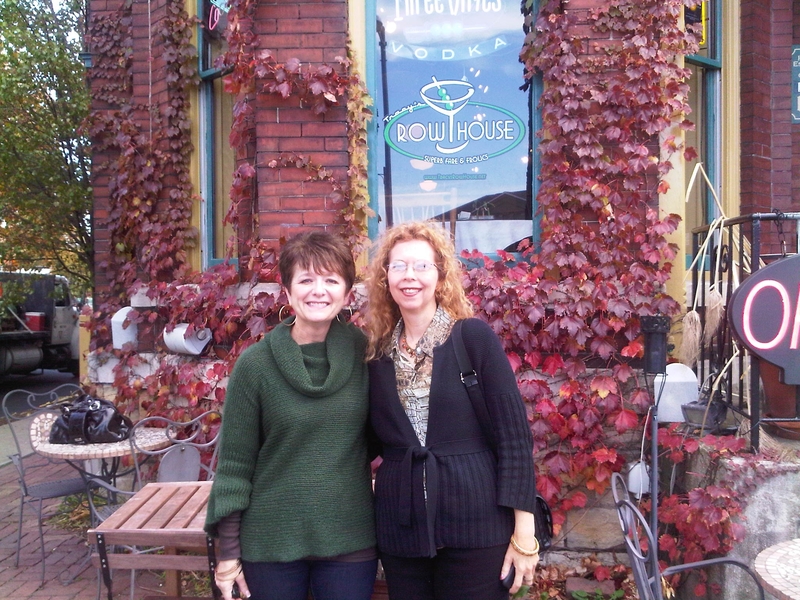 I thought she might enjoy Tracy’s Row House, located in downtown Ottawa, for lunch. We had a very nice visit discussing her book, finding out we were at Illinois State University at the same time, and also some of her upcoming book project. Here’s a photo of us outside Tracy’s Row House. Great October Read Alouds for Kids! There’s something mysterious, chilling, and spooky this month for the following read-alouds! I think we all enjoy a spine tingling story at any age. As always, the following titles are books I’m quite fond of reading during the month of October. A select few I’ve been sharing with children for literally decades! 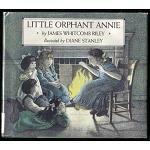 One in particular is, Little Orphant Annie, by James Whitcomb Riley. My mom read this to me when I was a child. I in turn, have carried on the family tradition by reading and sharing it with my own three daughters plus countless of students who have listened to it during their Library Story Time. I think you’ll want to add these to your collection! Fun Halloween version of The House that Jack Built! There is quite an array of creatures found throughout this rhyming cumulative tale such as a zombie, werewolf, mummy, and a bat – just to name a few! The children love chiming in with the lines as the story progresses. The illustrations done by Will Hillenbrand are bold, colorful but not too scary! Very entertaining! A little old lady is walking through the woods when she’s approached by pants, shoes, a shirt, a hat, and a pumpkin head. They eventually follow her home to scare her but the little old lady has other plans for them! This succeeds with children because there is much to act out throughout the story. They clomp, clap, nod, wiggle, and shout out BOO!! Delightful story to read aloud! Old Devil Wind by Bill Martin Jr.
Old Devil Wind is a guaranteed success as a cumulative tale read aloud! The spooky ghost and the dark haunted surroundings of the old house set the stage for some fun as the story begins. As the tale progresses kids will love to join in with the line, “It was a dark and stormy night,” until the very pleasurable ending! Here’s a delicious October tale that weaves in the idea of cooperation among friends. Duck, Cat, and Squirrel each have certain jobs to do when it comes to making Pumpkin Soup. One morning Duck awakens before any one else and decides HE will be the one who stirs the soup today. Trouble ensues when Squirrel doesn’t want to relinquish his job! This is a good story to discuss with children on how they should work together on a task and the importance of taking turns. There is also a delicious recipe for pumpkin soup found at the end of the story. I’m a fan of all of the Sheep books by Nancy Shaw! The illustrations by Margot Apple delightfully add to this rhyming imaginary tale….”As the Halloween moon rises/ Sheep are fixing up disguises…” (Shaw) The costumes are appealing to children because they are some of their favorites: dinosaurs, mummies, witches, and vampires! It’s fun to see how the wolves in the story are fooled by the sheep! AH!!! I simply adore this book! Chris Van Allsburg is such a brilliant storyteller. The illustrations compliment this witch tale. Readers are quickly drawn into the very opening of the story, “Witches’ brooms don’t last forever. They grow old, and even the best of them, one day, lose the power of flight…. On very rare occasions, however, a broom can lose its power without warning, and fall, with its passenger, to the earth below … which is just what happened one cold autumn night many years ago.” (Van Allsburg) Minna Shaw discovers a witch’s broom AND the witch in her field because the broom has lost its’ powers. She cares for the witch briefly until she has recovered. The witch leaves with the help of another witch but she has left behind her old broom for Minna. Minna quickly discovers it hasn’t completely lost its’ powers. She puts the brooms’ magical capabilities to good use around her home. Then one day a neighbor spies the broom chopping wood. He thinks it is evil and he plots to destroy it. Children are always enthralled by this mysterious tale with a quite astounding ending!